The Emergent Controversy has been raging through the American churches and I wish to put an end to once and for all. Right now. 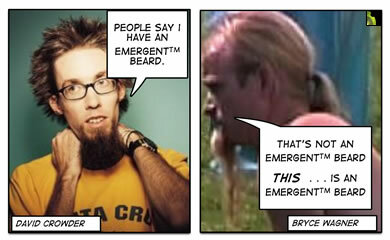 The official Emergent™ Beard pointed out by Kester and named “The Crowder” by Bob is NOT . . . I repeat . . NOT the official beard. – Marc at Purgatorio follows up his famous You might be Emergent if . . post with Help: I’m Going Hyper: 25 warning signs that you might be obsessing over Calvinism. I want you to know that i was led to this post and did not choose it out of my own free will. No freakin way, Tall Skinny! The Crowder® is sooooo the Emergent™ facial hair of choice. I’m telling you, the Emergent™® Convention was like a chin beard college of cardinals. The only way to tell the players was to measure the length of the beard! That Wagner guy’s got good length there, but the forms all messed up. It should expand towards to bottom, not peter out. The Crowder©™® is clearly the Official Beard of the Emergent Church™ movement! Alright. I’ve said it already, but I’ll say it again. Where does the beard thing leave emerging women? Is this another attempt to marginalize them? (wink). But seriously, too funny. Makes me wish I had facial hair. Does it count if you wear birkenstocks, while at the starbucks having the “conversation” about zen tattoos and their impact on worship while blogging about emerging church? IMHO Bryce’s extra length is offset by the plait. The Crowder + the Hedgecut™ on top just takes it. Thanks for the Calvinist laugh link. What a great way to start the day! Also, do I have to grow the beard or can I purchase the look if I am facial hair challenged? My question is one that no one seems to be addressing – What does an emergent woman look like?!!! if they leave their facial hair alone . . . maybe we would find out. which reminds me of a story about one of my aunties . . . .
What does an Emergent™ Woman look like? Ah, so unknowingly, I already have the official “alt.worship” facial hair. What a relief! 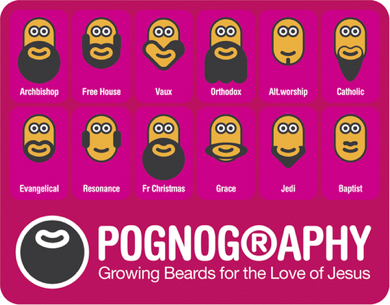 I hate having to change my theology to match my grooming.